Goodreads Summary: Since the night of her seventeenth birthday, Skye has been torn between two opposites: Light and Dark, the Order and the Rebellion, Devin and Asher. 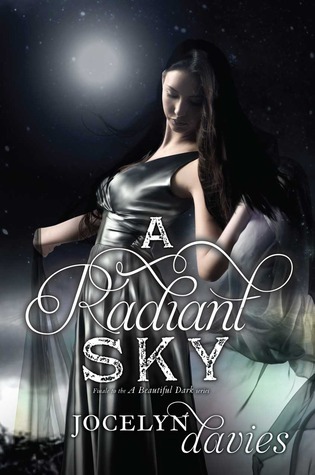 I finally finished A Radiant Sky, and I really liked it! It’s a really good conclusion to the series. I started out thinking the series was okay, but it got better and better over the course of the series. There are definitely lines that are drawn, and while there’s the Order and the Rebellion, you have a new group in town: the Uprising, who want to keep the Order and the Rebellion in check. I really liked the idea of the Uprising, because they are the ones who feel like they don’t belong to either group. So who better than to make sure that things are balanced? And I really liked the idea of a new council, and the people that comprise that new council. Because it was slightly unexpected, but still really interesting. I love that this series focuses on shades of grey, and that sometimes, the middle road is the best one to take. And that keeping two very different sides in check and in balance is important. At least in this series. I was wondering where things were headed, and I got the answers I was looking for. I loved that Skye had her friends and family to help her through this, and that they worked together, instead of Sky always running off to take care of everything herself. Her friends and family and love really did make a difference in things, and that was a really cool aspect of the book. We do have the final battle, and I have to admit that I was expecting more from it. Like, something more than a few pages, and something with a bit more action. I don’t know if it’s because of expectations from other series I’ve read or what, but I was expecting there to be something more from it. I will say that there was something about A Radiant Sky that didn’t quite fit. I mean, I really liked it and all, but there was also something about it that I couldn’t quite connect with. Things were pretty easy for Skye and her band of Rogues, so perhaps it’s that. I really liked A Radiant Sky, and I thought it was fitting end to the series. Things did seem pretty easy for Sky, and things were wrapped up a little too nicely, but other than that, things were resolved pretty well. A Radiant Sky gets 4 stars.